Do You Have A “Healthy” Retirement Plan? 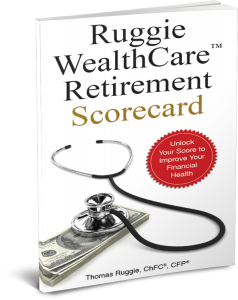 Improve Your Retirement Peace of Mind With The Ruggie WealthCare Retirement Scorecard! Then schedule a FREE, one-on-one consultation with a Ruggie Wealth Advisor in one of our three offices, who will help you understand where you are in the process of preparing for retirement and how to score the best possible financial situation for your retirement years.